March 20, 2013 / P.J. Though my little mantra started out as a vague positive-thinking mind trick, and I’m convinced it works, sometimes I find myself with so many trees between my lie and the basket (or whatever fairway spot I’m aiming for) that even a positive thinker along the magnitude of Stuart Smalley would have a hard time seeing holes. I’m talking about situations where I know realistically the chances of getting through clean on the ideal line are less than 50 percent. At times like that I’m forced to choose between the least “sucky” option. When it’s time to select from different options on the golf course, the scientific side of me kicks in. Thoughts of percentages and risk or reward kick in. You would think that would preclude the nebulous realm of “I see holes,” but the mantra actually has a place here as well. This time, though, the more applicable adjectives are practical, sensible, and the more golf-specific high-percentage. Depending on the situation, there are a couple of different applications for this approach. When your direct path to the target is blocked, look for gaps to the left and right that offer the best alternatives. Sometimes, as in the first example photo (click to get a larger view), you can hit the gap with a shot curves toward the target after it passes through. Other times the layout won’t allow for anything but a straight shot. Either way, though, it’s better to get most of the way there than to aim for a tiny slot and hit something directly in front of you. This approach usually applies to instances where the obstacles in question are not right in front of you, but farther away, and evenly distributed, so there is no single gap that is the clear choice. In situations where I see what appears to be a wall of trees blocking my route that is far enough away that aiming for one particular small gap isn’t feasible, I try to identify the least-dense section of that wall. It’s kind of like an attacking army would look for the weakest and most vulnerable spot. To be clear, I’m not talking about finding a single gap between two trees. In the situation I’m describing, the objective is to identify, aim for and hit a general area that offers the least resistance to a disc that wants to pass through relatively untouched. In a sense, I’m trying to find the one realistically hittable zone where there are more open spaces than trees (“I see holes!”). A key point is in situations like these, I have shifted my goal away from selecting the shot that can get me all the way to the target — because there is either no realistic option for doing so or the chances that I’ll succeed are extremely low — to selecting the shot that has the best chance to advance the disc as far as possible. As a left-hander throwing a backhand shot, if I get through the gap on the left with the throw I want, it will skip-hyzer right, in the direction of the basket. The right gap would require me to throw a shot that stays perfectly straight for 200-plus feet, a difficult feat to say the least. Most of the time, even when it seems like there are a lot of obstacles in the way, it’s mostly open space (holes, you see). Focusing on the space rather than the other stuff will enable you to hit those gaps more often. In other words, visualize success! When you find yourself hemmed into a particularly tight spot, take a wide view of all your possibly escape routes. If all the more direct paths to your target require hitting tiny openings with an unlikely perfect throw, settle for a higher-percentage throw that at least allows you to make some progress. When your obstacles are further away and no single gap stands out as the obvious route to take, look for a general zone that is the most open. Then target that large zone and revert to the first bullet point — think positive! In our final photo, there are three routes circled. You can see the basket is shown in the middle of the center gap. The question is, which gap would you choose (this is the right rough on hole No. 10 at DeLaveaga, by the way) and why? Give us your answer in the comments below and in a few days, we’ll share the way the author took and why. I’d go low & middle…with a bit of an anhyzer or a sidearm shot—whatever it’d take to get a slight left-to-right movement. 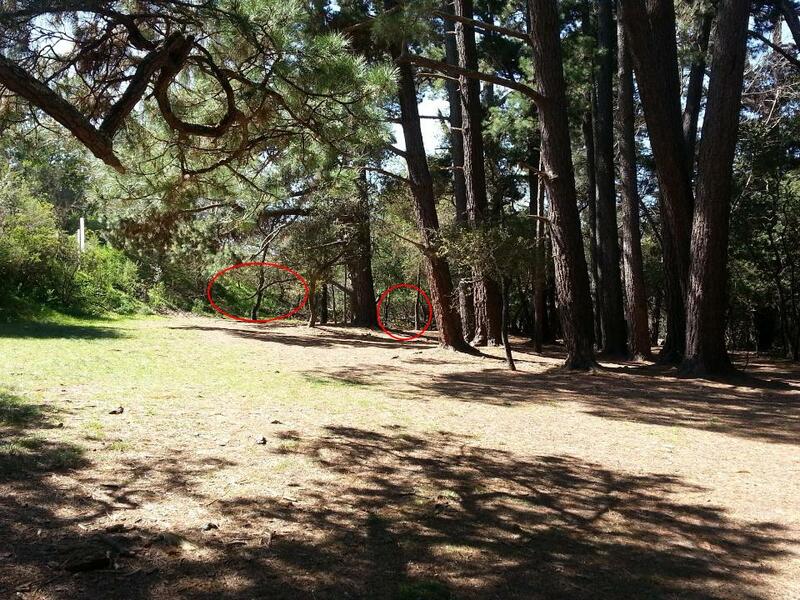 Perhaps the disc could land just to the right of that last tree (near the basket). The tree on the left seems too close to navigate comfortably around—at least, for my tastes. I often say something similar when gauging the options presented by my home courses. However, I usually begin with “I see holes” and end with “but can I hit them?” The answer when there is any doubt in my mind is usually a resounding “No!”. The problem that I think a lot of use face is the fact that if we play similar courses frequently we will put up blinders for a specific shot shape. When you play a familiar course, more often than not you are going to be presented with very similar lines. The problem is that unlike the course, your game is developing. You most likely have skills and distance that you did not have before, but because the route you have always taken is still available you opt for that line. For that reason, I like to play an alternate line round or 2. Meaning, if there is another line, however tight and misguided it may seem, on a hole I will play that line exclusively. I am sure that one day I will be forced to throw down a line similar to the alternate and be happy I have seen it before. Word to the wise: The alternate line round is not a DX plastic round. Break out the Z/ Champion! Addendum: I would go for a backdoor layup with an anhyzer (RHBH) because of the distance to the pin. Barring the fact that I am not sure if there is a wall of trees protecting the basket on the left. I am going to throw a big anhyzer up shot to the left with my putter. The low hanging branches on both the middle and right would be extremely tough to get through for me. The one in the middle particularly, I would be afraid of ending up left, behind the tree just to the left of the basket. With the up shot I can navigate around the trees and get it close for a short putt or tap in. The author, a lefty, would clearly take the hyzer route on the left again, 🙂 While a straight low shot seems to have a good chance for a right, I’d still probably play the safer anny route on the left. 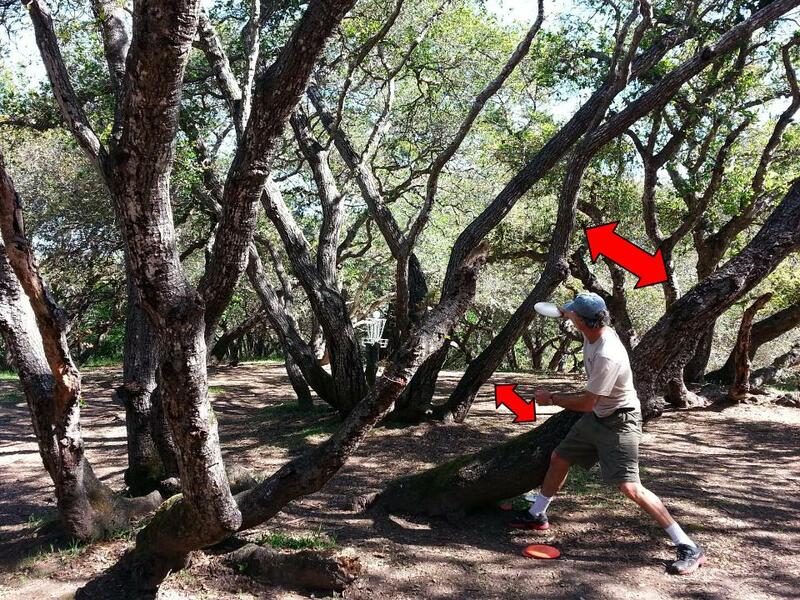 throwing right-handed, my approach in this situation would be to run a high back hand anhyzer through the left hole. Once through the gap it looks to open up and would leave me with a clean look at the basket,hopefully within my putting range. The middle gap looks to present too much of a chance of hitting a tree which could get you into deeper trouble. The gap on the right is not an option for me. Ahhh, but there is a wall of trees on the left between that gap and the basket, though since you can’t see it, that doesn’t invalidate any of the answers. As someone who found himself in that rough on Monday, depending on the exact lie, I’d either throw a flat hammer (sort of a scoober variant) up the middle, or a FH roller with my softest putter around the right side of everything (call it the fourth gap?). They all have the same relative distance on the initial gap but it really comes down to what obstacles are still present on the later routes to the basket and if the player was like the other 93% of players being right handed (sorry I had to do it for you Lefty)!! It comes down to the highest percentage gap available and the percentage (confidence) of hitting that shot with a backhand hyzer, a backhand straight shot or a forehand hyzer to the basket. What are you as a player capable of and what obstacles are present later in the route to still give you a putt if you were to unfortunate enough to hit a tree. But if you lefty (somehow), I’d take the left gap over the teepad through the walking path to park the hole or at least get a manageable 20-25 footer if you happen to catch a tree on the way. Doesn’t matter what gap I’m taking, I’m hitting trees. Guaranteed. So if it’s me, I’m looking ahead to the next shot to see where I’d get in less trouble. 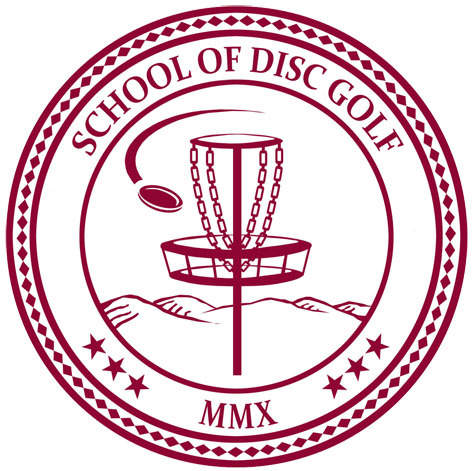 Knowing the way my discs fly and how my throws always seem to go, I’m doing one of two things here — attempting the right game in hopes of letting the disc fly around and get closer to the basket; or I’m going with a low overhand through the middle in hopes of it landing on its backside and sliding as close to the basket as possible. That’s become an important shot for me and works most of the time, so I’d probably do that. Well, try anyway! It looks to me that after the initial row of trees the most open space is to the right of the basket. With my average(or less)skills but a dependable RHBH hyzer shot I’m going through the right gap and have it fade towards the basket. I would throw right and try to stay low. I would throw an overstable disc to turn left after passing through the opening. Even though the middle path is more direct, the diagonal tree overhanging the gap would intimidate me; it would be less forgiving if I happen not to throw as low as I intend to, as opposed to taking the right side. As a RHBH thrower, the left side is not apealing at all; it seems that I would land a lot farther from the basket. Many, many great responses. Even (ok, maybe especially) yours Avery. I guess you don’t win a World Championship without knowing how to choose the right gap! I’ll start off by saying that I could have done a better job describing the layout of the spot I was in, as the picture doesn’t make the distance totally clear. 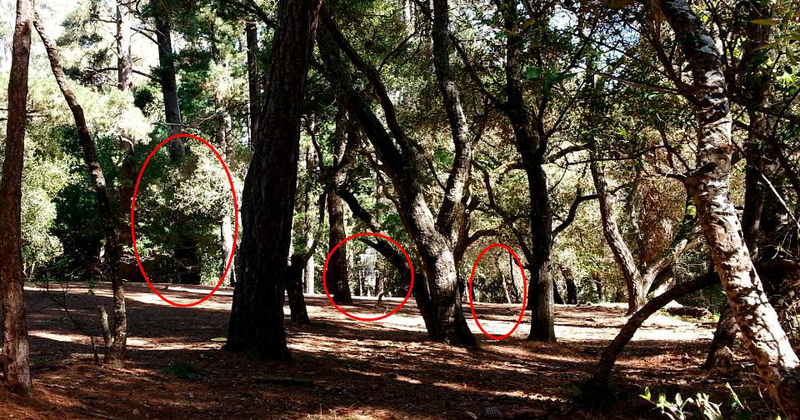 The lie was about 60 feet or so from the basket, Besides the wall of trees you can see (where the gaps are circled) there are those two other trees in line with the center gap evenly spaced between lie and basket. For that reason, the center gap is ruled out. If possible you want to be able to hit one gap and know that a good throw won’t have anything else to stop the disc. If you look close, you’ll see that the row of trees slants away from the lie, from left to right. Therefore the gap on the left is way closer than the gap on the right. That means it is easier to hit. (just think how much easier it is to throw a disc throw a doorway when you are five feet away vs. 30 feet away. Second, the gap on the left is also bigger. No explanation needed. Finally, when you combine these two facts, it boils down to one thing: The left gap gives you the best chance to end up with at least a chance to get a make-able putt for par. When you get in a tough spot like that, be realistic. Go for your best chance at a make-able putt . . . not a slim chance for a gimme. After all, in the end it usually comes down to making putts anyway! Sixty feet? I thought it was at least 120. RHBH – Anhyzer putter left to right through the left gap. Just right of the bright tree might have a chance to make it. 175 gram Destroyer,RHBH throw, 10-15 degree hyzer through the gap beyond the circled right gap. My aim point would be just left of where the trunk that arcs right in the foreground and the distant “y” shaped tree meet. Resultant skip would either lay me up next to the hole or in it. 60ft! right hand thumb roller thru the left gap. Responding to an old article, but I figure I’d add my two cents (I’m aware my opinions aren’t worth a dime). I would try the same throw as Critter. I do not have a strong anhyzer shot in my arsenal of throws and I also have a problem keeping a disc flying straight through the woods (it’s a mental block). I’m a rhbh thrower for the most part on technical holes, but I would consider a strongly angled forehand shot through the left gap. The only problem there is branches or a hidden tree (behind the big tree on the left) might easily get me. I have become pretty good at skipping Star Destroyers, Roadrunners, and Flicks though on several different angles and in this case, I think I would be more comfortable trying to get a skip to go through the gap and skip towards the basket. We have wooded holes at a lot of the courses here in Florida, but no course that I played at yet has that many options (or gaps) to attack a hole. There’s usually just one way through and you’re happy if you do and dang-it-I-want-a-Mulligan if you don’t.